Since this post will serve as my debut into the video game writing/review/criticism world I decided to start with a fantastic game that really sums me up in a single word. To introduce myself, these days on the web I am generally referred to as Pixelmixer. My real name happens to be Dustin Sparks. During my childhood, I went be Sparky or some variation of the word Sparks. The first time I saw the game Sparkster I was probably around 12 years old. I used to love to go to a local Flea market and visit this awesome video game booth that had seemingly every video game ever made. They would even let you load up any of the games they had and play them before you purchased anything. I stumbled upon this random game sitting on a shelf and decided I’d give it a shot, after all, it had everything cool in it, Knights, Rockets, Swords, and even Opossums. The icing on the cake for me was the name, Sparkster. Not long ago, this game was pulled back into the front of my mind when I discovered a game called Rocket Knight was being remade for XBL Arcade, PSN and PC, and that Sparkster was not the only game in the series. In fact, it wasn’t even part of the series that spawned it. 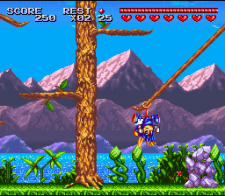 The original series is called Rocket Knight Adventures, and was a Sega Genesis exclusive. The game was a classic platformer based in an alternate reality future, Super Mario Brothers style and added special elements like a rocket pack that gave you a much needed vertical boost or extra horizontal attack powers. The revamped Rocket Knight game should be released sometime soon since the most recent update (October 09) mentioned a Q1 2010 launch date. The new game will be a 2.5D (3D environments, but 2D movement) platformer with new highly-details graphics and smoothed gameplay. From the current gameplay videos that are available, it seems the rocket and powers will pack quite a punch. Can’t wait to play it.